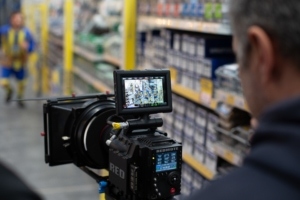 A TV advert produced for Selco’s builders warehouse. Selco’s is a nationwide builders merchant, they are known more for there radio advert “Selco’s, it’s where the trade goes” which you have probably heard countless times. And they were looking for a Tv production company! So, we were commissioned by Selco Builders Warehouse to create a series of TV adverts that would play at the start and end of every advert break during the show Sunday Supplement on Sky Sports 1. TV commercials, TV advertisements, commercial advertising or what ever you may call it, it doesn’t have to be boring! Selco’s wanted a fun and creative TV advert and we couldn’t have had more fun producing it for them. We handled aspects of this production from inception to final delivery to the TV studio. Also, we spent a lot of time with the marketing team at Selco to get to know the brand. The script is heavily influenced by the core demographic and time/location of the broadcast. It took meticulous planning in order remain within the time frame and budget. Because we’re a West Midlands production company, we were spoilt for choice when it came to actors and suppliers for the production. Altogether we created ten individual TV advertisements and one combined TV advert. 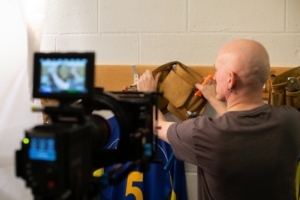 As a Tv commercial production company, we relished the challenge to use five seconds of screen time per advert to not only sell products/ services but also tell a story. The idents were created for Sky Sports 1 but further went on to air before and after the Sports Report during ITV News. Selco’s were so happy with the films that they also became a part of their social media advertising. “… Green Gorilla Films were resourceful and creative, nothing was ever a problem. What they produced was of an exceptional quality, despite various challenges and restrictions! Looking to create a TV Advertisement? Get in touch for a quote!